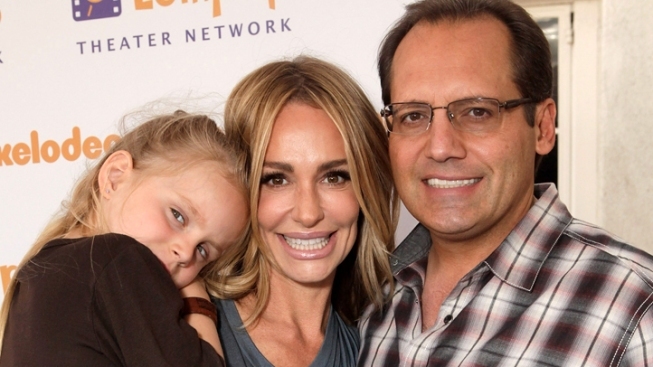 Russell Armstrong, estranged husband of "Real Housewives of Beverly Hills" star Taylor Armstrong, hanged himself, according to police. The husband of "Real Housewives of Beverly Hills" star Taylor Armstrong has committed suicide, according to authorities. Russell Armstrong was found dead after L.A. firefighters were called to the estranged couple's home Monday night, NBCLA.com confirmed. No suicide note was found. "I can confirm that Mr. Armstrong was found dead from an apparent hanging in a residence on Mulholland Drive," LAPD spokesman Richard French said. The death of Armstrong, 47, left his celebrity wife despondent, according to TMZ. She "is hysterical, and can barely speak. She has no idea why Russell would do this. She doesn't know how she is going to be able to tell her daughter, Kennedy," a source told the site. A spokesperson for Bravo released the following statement: "All of us at Bravo are deeply saddened by this tragic news. Our sympathy and thoughts are with the Armstrong family at this difficult time." Andy Cohen, Bravo executive vice-president, tweeted, "I am so very sad about today's news. My prayers and thoughts are with Taylor Armstrong and her family." Taylor Armstrong, 40, had filed for divorce in July. The couple had been married for six years and had a 5-year-old daughter. Armstrong cited "irreconcilable differences" in the divorce petition, and the couple's marital struggles were seen on the reality show. Taylor Armstrong had claimed that her husband had abused her by pulling her hair and shoving her, People magazine reported. He denied the hair-pulling but acknowledged he may have pushed her "in the heat of the moment," and said the TV show "has literally pushed us to the limit." The couple was being sued for $1.5 million by MyMedicalRecords.com, according to People, and sources told Radaronline they were under extreme financial stress.